CKUA has proven itself an indestructible public radio station that has been heard throughout the Canadian province of Alberta for most of its history. First, with a great low frequency AM groundwave on 580 KHz, and then, beginning in the mid-1970s, with 16 simulcast satellite-fed stereo FM transmitters across the province. CKUA began in 1922 as Edmonton Radio Supply owners' Jim Taylor and Hugh Pearson put Edmonton's second radio station on the air. Then known as CFCK, with 50 watts on a shared frequency, it grew to become Selkirk Broadcasting, one of Canada's most influential radio owners until it was sold to Maclean Hunter in 1989. 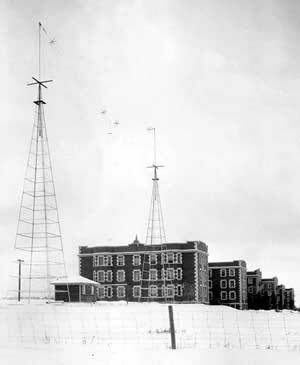 But in 1927, Taylor and Pearson sold CFCK to the University of Alberta for $600, and the call letters were changed to CKUA, with the "UA" for University of Alberta. A new 500 watt transmitter was fired up on November 21st and CKUA was on the air, sharing its 580 KHz frequency with three other Edmonton stations. Within five years, CKUA's existence was already being threatened. Not by the Great Depression, but by a British Privy Council decision that Radio is a federal responsibility in Canada. Although a planned BBC style government radio monopoly never became a reality, radio ownership by "other levels of government" was disallowed. But CKUA somehow survived, first by its operations being moved to Alberta's government-owned telephone company on May 1, 1945, and then, on March 31, 1974, to a special Alberta government entity created to meet changing federal regulations. In 1987, the Alberta government wanted to get out of anything that looked like Business, including Broadcasting, first trying to sell CKUA, then setting it adrift to fend for itself in 1994. And CKUA survived again, despite being taken off the air on March 21, 1997, by its Board of Directors. A new Board was formed after a very large outpouring of public support and donations, and CKUA was back on the air in five weeks. And hasn't looked back since. The CKUA Style heard here may remind you of the FM Underground format of the late 1960s, but the station actually invented it themselves in 1964, well before the San Francisco Sound, thanks to the collaboration of two CKUA announcers, the late John Runge and the retired Bill Coull. John later left CKUA for a time, to help launch Canada's first FM Underground station, CKLG-FM in Vancouver, on March 16, 1968. To celebrate the 09/09/09 release of the remastered Beatles albums, Tom Coxworth's weekly Folk Routes program became Beatles Routes. Hour one explores the early influences on the Beatles, while Hour two looks at musicians influenced by the Beatles. Tom certainly has the credentials to pull this off, having hosted a weekly program for the last 23 years from his own 10,000 album library. You'll hear Bert Weedon, The Goons, Lonnie Donegan, The Vipers, Chris Barber, Gene Vincent, The Shadows, Marty Wilde, Cliff Richard, The Everly Brothers and many more, including The Quarrymen without Ringo. And that is just in Hour One! This aircheck's debut on REELRADIO coincides with the week of the first anniversary of the 09/09/09 release of the remastered Beatles albums. Because I first heard this program while channel surfing in the car, I have no recording of my own. When I asked a friend at the station for a copy, I discovered that they only had the MP3 copy that they aired because Tom records the program in his Calgary home studio earlier the same week. My friend got me CD copies of Tom's original program masters, but that left me to re-create the original breaks and a few seconds of missing audio from the program itself. I did that by recording Tom's program off-air two weeks later and piecing together some "best of" breaks for this aircheck. The items in each break were chosen not just for content, but also the range of CKUA announcers that voiced them. For example, Bob Chelmick, who does the station ID in the middle of the first hour, was an announcer at the station in 1969. He left for 28 years with the CBC, where he became a popular Supper Hour TV News Anchor, before returning to CKUA in 2001 to do Morning Drive. Most recently, he moved to an isolated cabin where he does a one hour show four evenings a week. Bob's 1969 start date is by no means a station record. Another announcer heard each week started with the station in 1949!